What’s the going rate, the market value, for refugees and asylum seekers these days? Ask the Australian government. Australia and Cambodia are close to finalizing a deal on refugees. No one seems to know the details of this arrangement, because both countries are keeping it very hush-hush. But what we do know is it involves refugees and asylum seekers being moved from Australia’s catastrophic adventure in Nauru, to Cambodia. Some, in the Cambodia opposition, say this could involve as many as 1000 refugees, and they are most likely going to be `relocated’ on a remote island off the coast of Cambodia. We also know that Australia is one of Cambodia’s largest aid donors. Over the past four years, for example, Australia has donated over $329 million to Cambodia. We know that Cambodia is one of the poorest countries in the world. We also know that Australia has criticized Cambodia’s human rights record, more than once and most recently at the United Nations. We are told that refugees will be `relocated’ only if they volunteer, but if they refuse to volunteer, their refugee status will be reviewed. In both Cambodia and Australia, opposition to this deal has been fierce and intense. Much of it has centered on the conditions in Cambodia and the folly of sending refugees, many of them fleeing the violence of conflict zones, to an area just emerging from a long and brutal civil war. Others point to the economic hardship of life in Cambodia and others to the difficult political, civil and human rights situation. What about the marketization of refugees and asylum seekers? Australia won’t be `relocating’ refugees. It will be dumping human beings, like so much cargo, and wiping its hands clean … or dirty. One thousand human beings who have asked for help and have already been dumped on one inhospitable island are now to be dumped again on another, even more inhospitable island? This `deal’ takes the privatization of `care’ for asylum seekers and refugees to a new, and yet very old, place: offshoring. 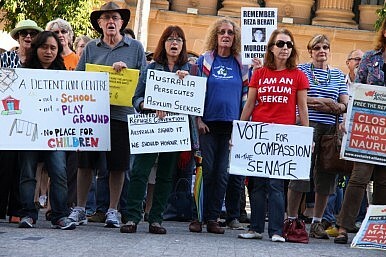 Cambodia will `volunteer’ to take the refugees because Australia has offered it cold, hard cash, or financial benefits. And so the entire region will become one giant marketplace for human cargo, not quite slaves, not quite not slaves.